Are we deprived in Canada? yes that is ALL Red Hat jewelery ! Headcovers http://www.headcovers.com red hat scarves etc. Lady Dress Up http://www.ladydressup.com/ hats etc. Red Hat Fashions 4 U http://www.redhatfashions4u.com/ One of the best sites for Red Hat "STUFF" (wicker hat stands are great!) Costume accessories too! Red Hatters Delight www.redhattersdelight.com will ship to Canada - good store! Above is a photo of earrings, pin and hanging angel that Dawn made. All the items are hand made by her in her home in Kamloops. $10.00, the earrings are $12.00. payment should be taken at the time of the order - if you need them mailed by Dawn of Bee Jeweled she needs to charge a fee for that - the cost of a bubble envelope so they don't get crushed and the postage - usually total cost for one small envelope would $4 to 5$. (the following are red hat web sites - not official red hat merchandise perhaps but web sites referred by some of you) Just places where we can find some of that "special" red hat "stuff"
Nothing is endorsed or supported by this web site or it's sponsor(s). My name is Cheryl and I have recently opened an upscale ladies accessory boutique located at 2653 Pandosy St in the Mission of Kelowna called CoCo Boutique. My product lines are all new to Kelowna. I carry jewellery, belts, shoes, boots, scarves, wraps, handbags, evening bags, hats, gloves and Spanx. 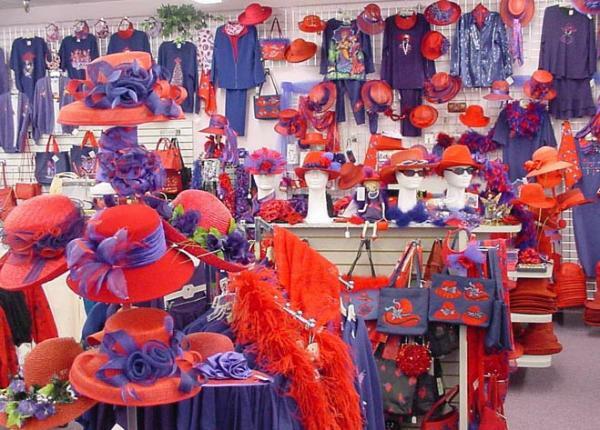 As I am quite familiar with the Red Hat Society, I am carrying a great selection of beautiful red/purple dress hats as well as accessories such as bracelets, watches, pins, earrings, scarves and more. I know you ladies love to have fun so I would like to invite your chapter to my store to have fun and 'play' with the hats. Elegant upscale (expensive i.e. $100) red hats, pink hats coming, Red Hat Jewelery and bling. I am closing a deal on a 3000 sq ft building in Shelbourne ( hwy's 10 & 89 ). about 1/2 hour drive north of Brampton. Most of the store will be dedicated to Red Hat and will have a 'playroom' where up to 40 ladies will participate in themed events. The store will be big enough to allow for bus trips as well. Shelbourne is only 40 minutes from the Cookstown outlet mall. ( I remember you were originally from Ontario so some of these names should be familiar.) What's on the online store is only a small sampling of the variety that is in the store. 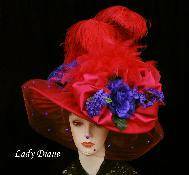 My hats come from the Red Hat Society and other US and Canadian, Italian and Austrailian designers. For Spring 2007 I am introducing my own hat design. There will be only 9 available worldwide. NEW - Vista Print now has Red Hat Ladies note cards and stationery - calling cards etc. http://www.redhatfashions4u.com/ One of the best sites for Red Hat "STUFF" (wicker hat stands are great!) Costume accessories too! Custom fitted Hats of all styles. 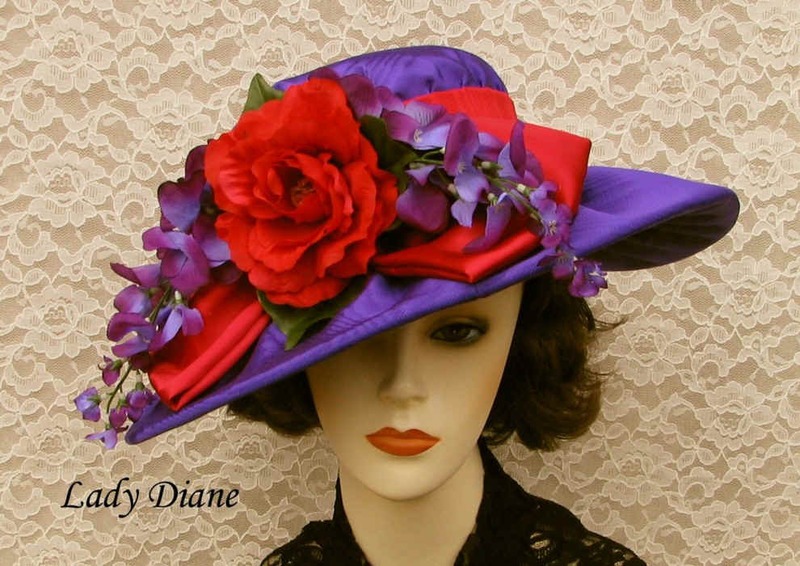 diane@ladydianehats.com We can ship to Canada . The shipping is about $15. Queen Blabalot’s purple shawl is by Lady Diane. We have a lot of fun with the Red Hat groups. We have a standing invitation for any Red Hatters to come over the our home for tea, coffee and goodies for an outing. The girls can see how these hats are made and generally have a great time. Please remember that you are always welcome at our home here in Coeur d'Alene , Idaho if you are ever in the area. 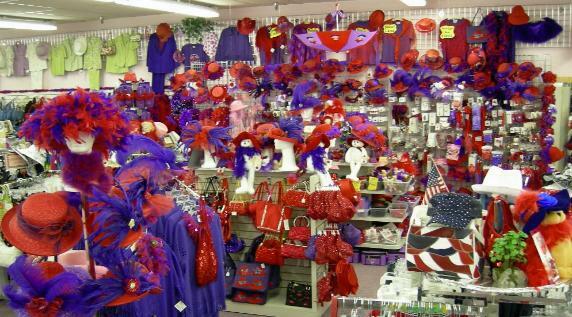 Also, note that Red Hatters receive a 30% discount on Red Hats. Ladies, we all love to shop and what's more fun than shopping for Red Hat "stuff"
Have a Red Hat Swap & Shop on-line or an in-home party! If you have red hat clothing or jewelry, accessories etc. you no longer use, why not re-cycle among other red hatters. Send a .jpg photo of your item and an email address and we can post it here on the web or host your own party at home. Leftovers could then be donated to a local charity/goodwill shop. 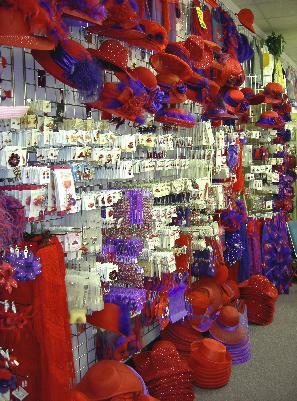 You can order LOTS of items on the Red Hat Society web site www.redhatsociety.com at the Imperium.... or you can order on your own through www.ebay.com and www.ebay.ca and the many many other web sites... we'll list a few here.. We are just making a suggestion that this method of ordering merchandise is a possibility for us. Gail in Penticton loves this web site: http://www.fatimastreasure.com/ for red hat treasures. Penny in Langley said: "I make red hats. You can custom order them too. I don't make much money on them maybe $10.00 I just enjoy doing them. They range from $12.00 to $55.00 most of them are really unique. And you can get a realy great hat for $35.00, also do little ones for summer and evening wear. If any one is interested please bring your ladies over, and come for tea. Penny Moon 604 882 1280 - 22116 88th. Ave Langley. Anna, Queen of the Castlegar Feline’s Fancy Cats: I too found a shortage of funky red hats, so I make them. I will send you some pics if anyone is interested. My hats are custom made to suit the person’s personality and or hobby. There are no 2 alike and are fully adorned complete with tulle, ostrich feathers, roses, etc. If anyone is interested, just email me at felinefancycat@yahoo.ca and we can chat further for your requirements. $5.00 US + shipping, taxes, handling etc. NOTE: This does NOT fit the B.C. lic. plate. THIS PAGE SHOWS A SAMPLING OF WHAT IS AVAILABLE ON-LINE. In checking local stores here pins were running approx. $28.00 which seemed high as the same pins were $8-12US in the USA when I checked last month. Buying in bulk can mean good discounts for us! Finding "red Hat' items in Canada is "challenging" and prices are quite high. The following items are a sampling of what we can order.